Teamspeak comes with a very versatile system of binding options to certain keys so you have maximum controle over teamspeak without actually having to enter the program itself. To bind keys go to the settings tab and choose key settings.You will now enter the window where you can actually bind functions to keys on your keyboard. To bind a function to a key press add. You can bind up to 3 keys simultaneously by pressing the set buttons. In the drop-down box under action you can specify what action that key or combination of keys should perform. 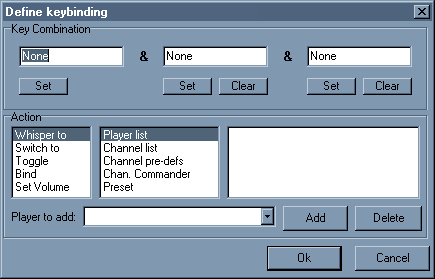 In case that the action involves another person in the channel, let’s say you want to whisper to a certain person, you can choose the person in the second drop-down box on the right. Finish the key-bind by pressing add and then ok. You now made yourself a key-bind. In this fashion you can bind a key to change channels, or to mute your sound, whisper to a friend , mute your microphone, whatever you need. 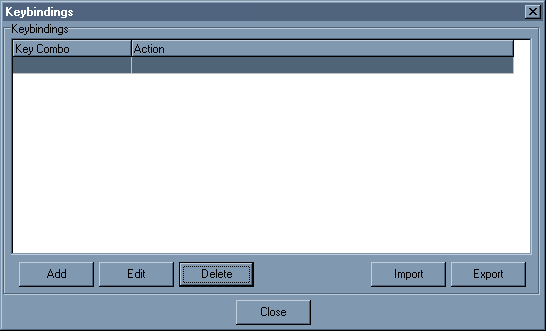 In the main key-bindings window you can also edit or delete your previously entered binds. With the export/import buttons you can save and restore your key-bindings (you can even use this file to share it with your friends). If you are satisfied with the key-binds you made, you can save by pressing the export button. If you for some reason loose your binds and want to restore them press the import button and select the directory where you exported your key-bindings.